Digital media evidence recovered from the scene contradicted Huck’s story. The last time that Dana was seen alive and well on camera — on the night of March 2, 2014 — she used her iPad at the kitchen hutch for several minutes. She walked away from the hutch, without her iPad, never again to be seen alive and well on camera. In the home-surveillance recordings seized by the police, no one was seen using the iPad or removing it from the hutch after Dana walked away. 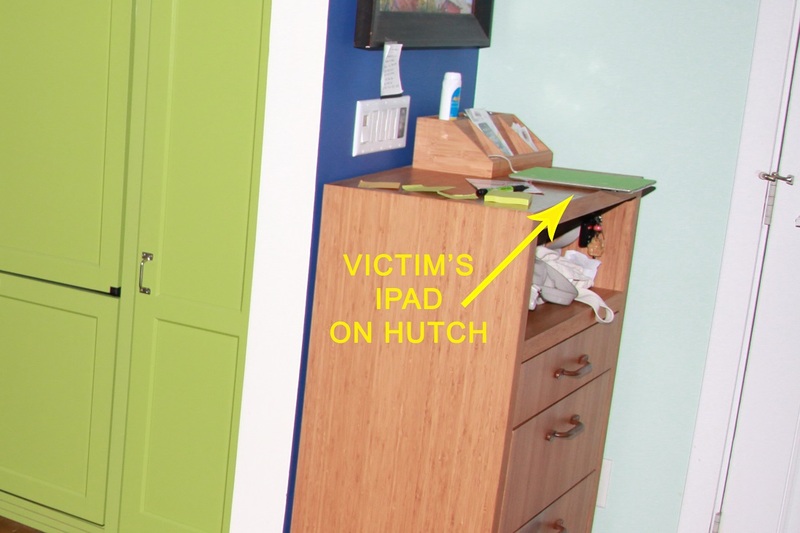 LBPD homicide detectives found and photographed Dana’s iPad on the kitchen hutch exactly where she had left it — far away from the yoga room. If the iPad had ever been in the yoga room, who put it there? Who returned it to the hutch, and when? Detective Johnson’s erroneous assumption that Dana was watching a yoga video on her iPad at the time of her “accident” was based entirely on Huck’s say-so. The detective apparently ignored evidence that contradicted Huck’s story.